"Pay It Forward". . .
Do you have any complaints about your life? Maybe a job, or a relationship, or a financial situation that you wish was different? Maybe you wish you were a certain somewhere else. Or maybe just any anywhere else. Do you ever think of life as a large disappointment? Do you ever think about trying to change it? Probably not. Yet this is the task that director Mimi Leder ("The Peacemaker," "Deep Impact") tackles in the newest release from Warner Bros.--"Pay It Forward," which was sent into wide release on October 20. Judging from the success--or lack thereof--of her first two films, you might think that "Forward" is just another emotionless wanna-be tearjerker with a decent plot that is acted out poorly. But you couldn't be more wrong. Leder does so many things right with this Oscar-bound flick that it makes you wonder just what happened the first two times out. The first thing Leder brings is a great plot. Based on a book written by Catherine Ryan Hyde and adapted to a screenplay by Leslie Dixon ("Mrs. Doubtfire," "The Thomas Crown Affair"), the story is that of a 7th grader, Trevor McKinney (Haley Joel Osment, "The Sixth Sense"), who is challenged along with the rest of his social studies class to come up with a plan that would have an effect on the world. Armed with that very basic concept, Trevor constructs a plan where he does one big favor for three people. And then those three people do favors for three other people. And so on, and so forth, until the entire world is doing favors for everyone else. Scary to think about the real-life potential--not to mention that, all machismo aside, there are a lot worse ways to spend your time than doing things for other people. However, Trevor learns quickly that his willingness to make the world a better place is just not enough. He helps someone, who ends up not paying it forward. He tries to help someone else, but is unsuccessful. And he attempts to hook up his recovering alcoholic mother (Helen Hunt, "As Good As It Gets," "Twister") and the very same social studies teacher (Kevin Spacey, "American Beauty") who gave him the assignment. But various personal problems prevent that from happening, despite Trevor's numerous attempts. But, as Trevor learns, just because you don't see it happening, doesn't mean it's not. The second element Leder brings is a star-studded cast that turns in one of the greatest performances of 2000. The trio of Spacey, Hunt, and Osment have four Oscar nominations--with three wins--between them, and it would be a huge shock if all three were not nominated again this year. Osment is especially brilliant in his portrayal of a 12-year-old who knows what he wants, and knows what he has to do to get it, but can't quite come to terms with the fact that because someone else isn't trying hard enough, he can't have it. If you thought he was great in "The Sixth Sense" just wait until you see his sophomore effort. Spacey also shines, as he always does, this time as a teacher with a deep emotional scar in his past, which makes his physical scars seem ordinary. Oscar wins for both of them wouldn't be a surprise. Beyond that, great performances are turned in by the supporting cast as well. Jon Bon Jovi ("U-571") is surprisingly good as Trevor's abusive natural father. James Caviezel ("The Rock," "Frequency") shines as a homeless man who becomes Trevor's first project. 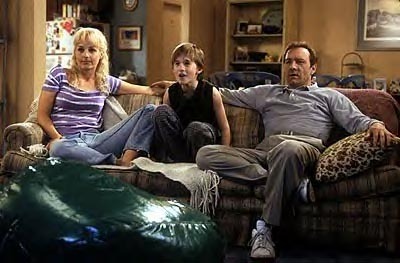 And Jay Mohr ("Jerry Maguire") is excellent in his role as one of the people who benefit from Trevor's plan. Helen Hunt, Haley Joel Osment and Kevin Spacey team up in "Pay It Forward"
directors have had success with plots that don't go in chronological order, Leder's masterful use of two plot lines here adds an element of suspense to the movie. And beyond all else, Leder and Warner Bros. managed to build a great trailer, one that is descriptive enough to bring viewers out en masse, but keeps enough hidden so that an audience doesn't leave the theater wondering why they didn't just watch the previews a few hundred more times. The idea that Trevor comes up with is extremely unique. And while the cast that was chosen to act in the movie definitely adds an Oscar feel to the hype, Leder manages to balance everything out. She combines a superstar cast with a message that has definite potential, and the end result leaves the viewer saying, "Hey, this isn't just some Hollywood money-maker. This might actually work!" And while Mimi Leder may have not changed the world, "Pay It Forward" will live up to its name, doing just that to not only Leder's directing career, but to its all-star cast come Oscar time.